As if taken from a fanciful fairytale and deposited on Turkey’s Anatolian plateau, Cappadocia is a geological oddity of towering boulders and honeycombed hills that is unique in the world. Turkey can also claim a gemological oddity that is unique in the world - Csarite®. Csarite offers different colors under different lighting conditions. 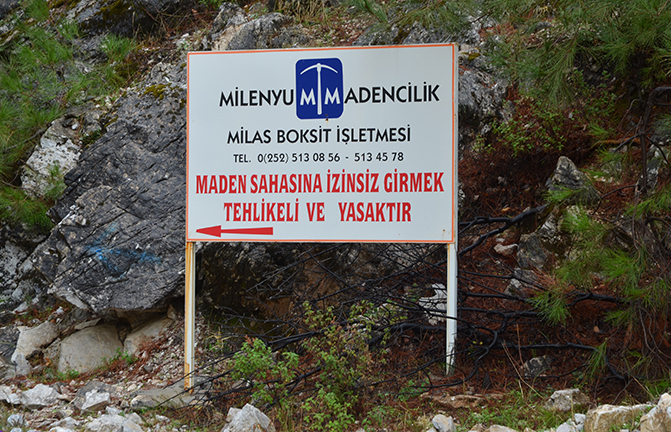 Sign pointing to the entrance of the mine where Csarite is found in the Ilbir Mountains of southwestern Anatolia. One of the mine shafts with ore waiting to be taken from the mine. 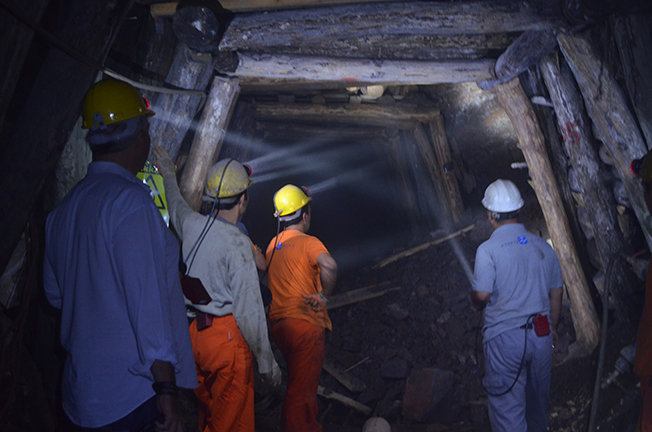 Miners looking for Csarite deposits. Turkish gemologist and expert on Csarite, Fazil Ozen, climbs up one of the steep stairs in the mine where the unique gemstone is found. A deposit of Csarite crystals found in the wall of the mine. 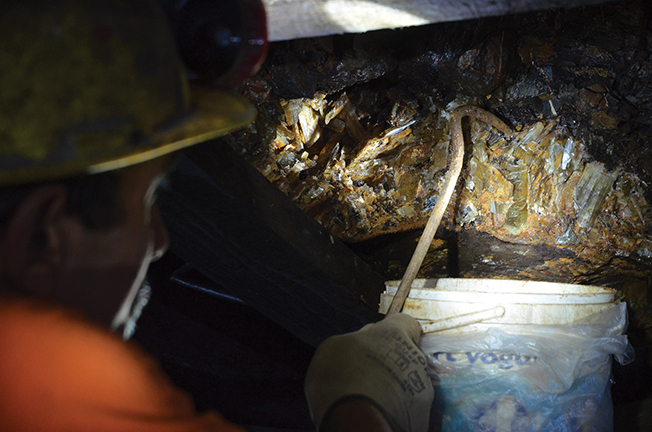 Workers sort through the rocks brought up from the mine to find the rare Csarite crystals. Handful of Csarite crystals right out of the mine. Dawes Design created this pendant using a Csarite crystal set in gold with diamonds. Left: The world's largest faceted Csarite, 121.65 carats. Right: 88.49-carat Csarite, AGTA winner. Samples of Csarite in fancy cuts that show the various color ranges. Csarite and diamond ring in gold by Katie Diamond. 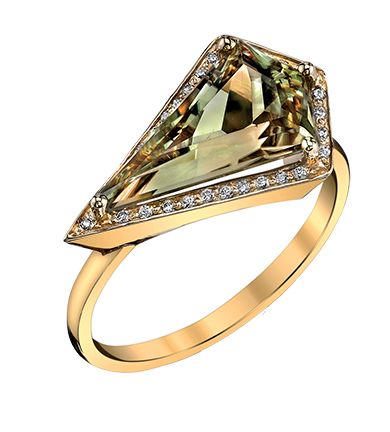 Cabochon Csarite ring in gold with diamonds by Victor Veylan. Csarite pendant set in gold with diamonds by Varouj. An unexpected discovery was made a few years ago in an aluminum mine in Turkey. 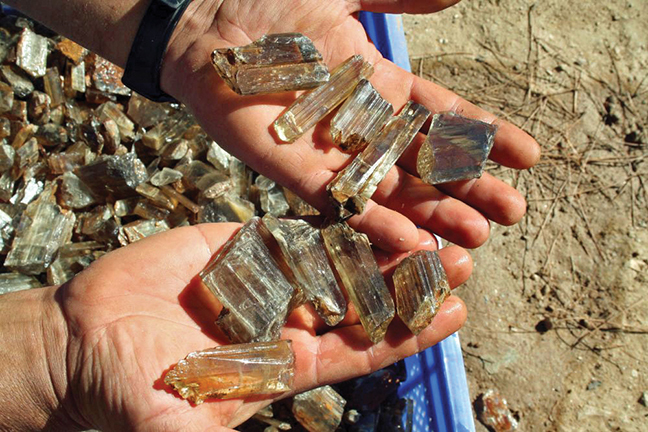 High in the Ilbir Mountains of southwestern Anatolia, miners in a bauxite mine found a transparent diaspore mineral that was not only gem quality, but was color changing. Since this phenomenon occurs in less than one percent of gemstones, it was a real discovery. Even more interesting and unlike most other color-changing gems, this new diaspore had the ability to display sev­eral different tones of color at the same time. Realizing the importance of this unusual find, Murat Akgun, president of Milenyum Mining Limited (MML), Turkey's leading bauxite exporter, introduced this unique Turkish diaspore to the gem world at the Tucson gem shows in 2006. Akgun later trademarked the name of this remarkable stone as Csarite®. Found in only one area in the world, the hydro­thermal-metamorphogenic mineralization of Csarite [AlO(OH)] occurs in fracture zones, both veins and open structures, that crosscut the metabauxite hori­zons. In these deposits, located at 3000-feet elevation, the gem is associated with calcite, muscovite, hematite, ilmenite, and chloritoid. Its crystal structure is orthor­hombic, with a hardness of 6.5-7.0 and a refractive in­dex of 1.70-1.75. Ten thousand times rarer than a diamond, Csarite’s range of colors mirrors the spectacular Turkish coun­tryside with its beautiful shades of greens, peaches, champagnes, and raspberries. Because each stone is unique, Csarite is sought after by collectors and jewelry designers alike who appreciate the rarity and unique­ness of this exceptional gem. The gem is 100 percent natural and never treated. According to Akgun, only about 50 percent of the rough crystals are suitable for faceting and, of those, 98 percent is lost during cutting, giving a 2 percent yield. Most rough yields the popular jewelry sizes of one to three carats, with sizes greater than five carats exceedingly rare. The largest Csarite to come out of the mine is an exceptional 121.65-carat pear-shaped gem. As today’s consumers increasingly demand responsi­ble sourcing for their gemstones and jewelry, they can have peace of mind with Csarite. Coming from only one mine in the world, each stone is truly traceable from mine to market. And, the mine is firmly commit­ted to the active protection of nature and the support of the local community. 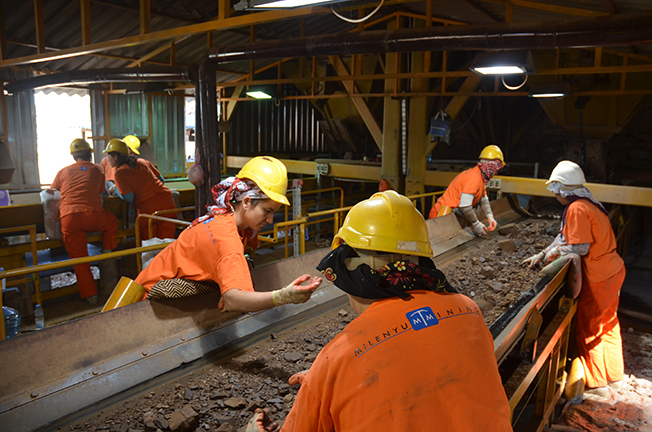 The mine adheres to the “principles for responsible artisanal and small-scale mining,” as published by the Alliance for Responsible Mining (ASM), explains Murat Akgun. It incorporates environmentally safe procedures that protect water sources from chemicals, debris, rubbish, silt and biological pollutants. It mini­mizes the destruction of flora and fauna, and restores mined land as close as possible to its original condi­tion. 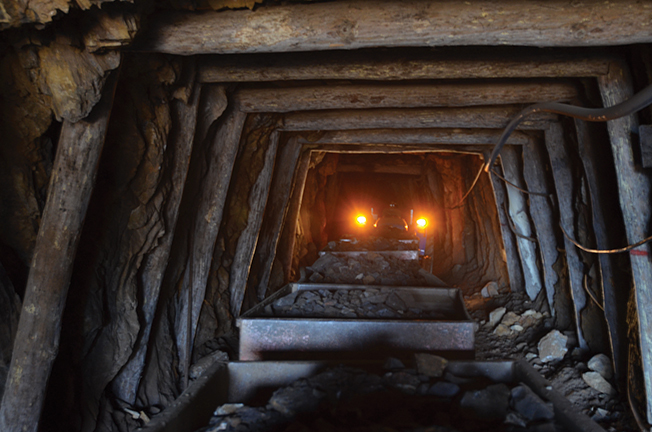 Since the mine is underground, the effect on the surface environment is minimal. Among MML’s Corporate Social Responsibility (CSR) practices are the planting of ten trees for every one tree lost, the use of chemical-free extraction pro­cesses, wastewater removal by trucks to avoid soil con­tamination around the mining areas, and safe working conditions for all employees. In addition, miners are housed and fed onsite, paid more than the average earnings for miners in the region, and work six hours per day. Support to the local community includes supplies and other resources to schools in the surrounding areas. Importantly, to ensure quality and total transparen­cy throughout the supply chain, all of the rough gems are cut and polished under MML’s control. The larger pieces are sent to MML’s cutting facility in Canada where they are faceted by third-generation master cut­ters Rudi and Ralph Wobito. The smaller high quality rough is sent to a cutting facility in India. Because of the high demand for these rare gemstones, there are many imitation stones on the market, offered by unscrupulous jewelers and dealers. Gemologist Fazil Ozen, who is also Turkey's Ambassador to the International Colored Gemstone Association, says that imitation stones are not well cut and tend to be in standard, calibrated sizes. "If you see Turkish diaspores of the same size and shape, especially big gemstones in large quantities, it is highly likely these are not genuine," he explains, adding that if the color-change property is very sharp in daylight and in incandescent light, the stone is probably not natural. "Genuine high-quality and well-cut Csarite with strong luster and color-change properties carry higher prices, notes Ozen, "especially when the stones are large. Gemstones of this quality and size can easily reach a few hundred US dollars per carat. The provenance of the stone can now be determined in reputable gem labs." "Natural Turkish diaspore is often exceptionally eye-clean and some crystals are found to produce a chatoyant or 'cat’s-eye' effect and a single ray of light across the surface of the stone," he says. "Alexandrite used to be the only color-changing gemstone with this cat’s-eye effect until Turkish diaspore came on the market." The UK and the USA are the main markets with approximately 90 percent of faceted diaspores exported to these countries. The most amazing qualities are indeed its remark­able color changes. Unlike most gems with this property, Csarite’s color change extends beyond the usual two colors. The same stone can exhibit khaki greens, cognac pinks, canary yellows, pinkish champagnes, raspberry purplish-pinks, sage greens and vibrant gingers under a variety of different light sources, easily complimenting any color scheme in the fashion wardrobe of the wearer. A faceted and very rare 88.49-carat Csarite took honors in AGTA’s Cutting Edge Awards’ Phenom­enal Gemstones category in 2014. That same year, MML donated two large gems—a 159.33-carat cat's-eye cabochon and a 44.48-carat faceted oval—to the Smithsonian Institution’s National Gem Collection. ​ “To our knowledge, currently there are fewer than 20 faceted Csarite gemstones in the world that have a weight of 40 carats and above. Given the rarity of this unusual gem, we feel the Smithsonian’s National Gem Collection is a fitting home for two of the few examples available in this size and quality,” comments Akgun. What a perfect way for even more people to appreciate Turkey’s unique gem. Lovely Csarite and diamond ring set in gold with sapphire accents by Erica Courtney.